One of the new features on the newer automobiles on the road is the LED wrap around(s) the small led’s that run or follow the headlight shape. I really dig that, think they are a well added safety feature and at the same time, an attractive add on as far as styling goes. 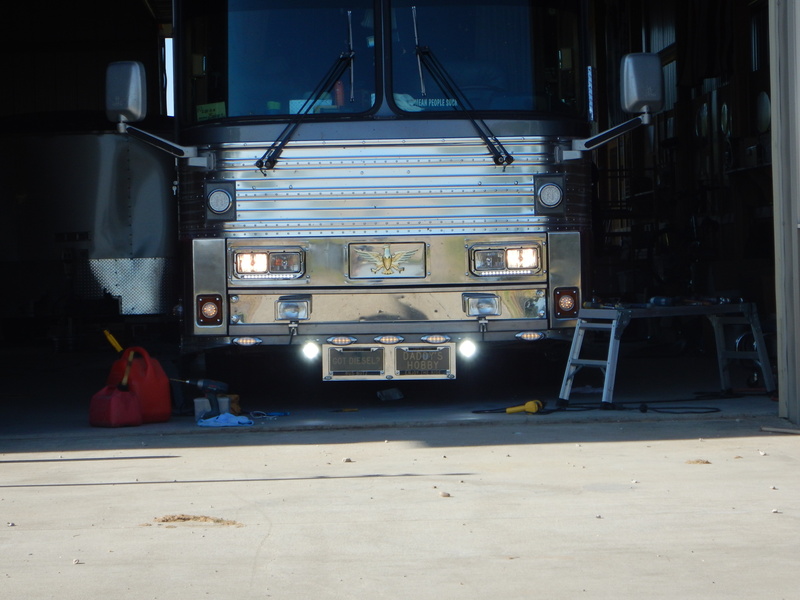 My friend Perley Benson has wrap around LED’s on his bus and they look sharp. I had wanted to do this, but could not figure out a method. This weekend I finally put it all together and the results are very nice. A few years back I updated my headlights to 89 model appearance so I have square headlights which presented a problem for me. 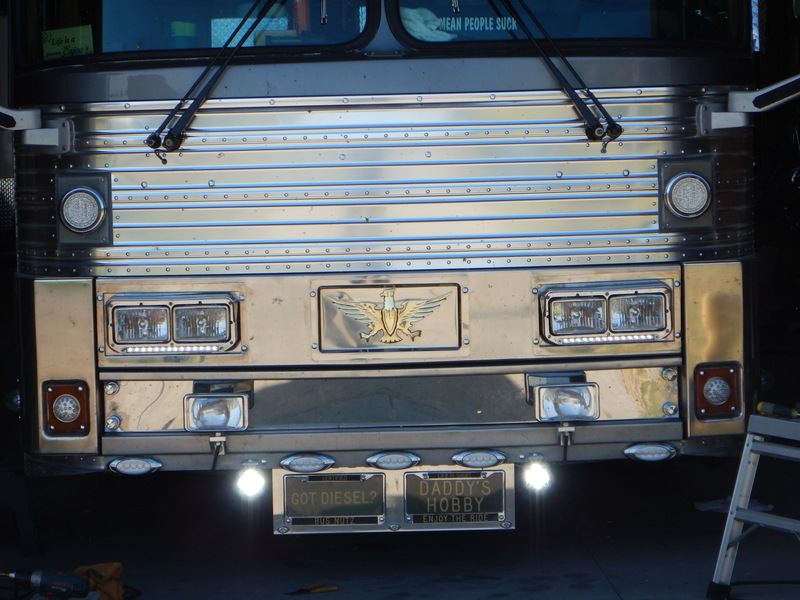 I found some Headlight covers from United Pacific at a Chrome Shop and adapted them to my use, most truckers run them with an amber lite (turn signal), but for my purpose, I changed that light out to a white light. I also added two 800 lumen mini-led’s and wired all of it to run 24/7 on a 15 amp fuse (to the left and right of tag plate). You could put them on a switch if you wanted to, I chose to lite ‘em up all the time (any time the ignition is on, they are on) as LED’s are low-current draw and a long life as far as use is concerned. Not long ago I read where a bus company back east converted their entire fleet over to 24/7 day-light running lights, and the results were amazing. In the first year of running with the headlights on all the time, day or night, they noted their accident rate drop 20%. That was enough to sell me on the idea right there. The above is a shot with the headlight on, you could take it a step further, and change out the headlights to the new Westinghouse Bright White Lights but that gets pricey ($100 for four bulbs). As I am a big fan of the two-lane highways in America, the added security of more visibility appeals to me and I also found that a major consideration in the project. The entire thing, took about two and one-half days, a little metal fabrication and an outlay of just under $200 to complete the entire job. This entry was posted in Bus Life and tagged busing, headlights, safety, silver eagle bus, two lanes. Bookmark the permalink. ← Gawd Help Me … I Am Feeling Normal Again.